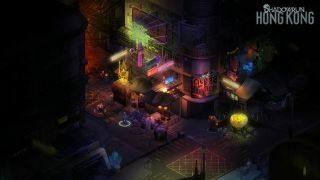 Shadowrun: Hong Kong—Harebrained Schemes' third Shadowrun RPG—has a release date, announced on the second anniversary of Shadowrun Returns. The Shadowrun: Hong Kong Kickstarter was launched at the start of the year, and generated over $1.2 million for its developers. The project, and the many, many stretch goals it achieved, will now be delivered next month, on August 20. The game is an RPG set in the cyberpunk Shadowrun setting—a place where magic and technology collide. Shadowrun Returns was a little rough around the edges, but it's follow-up, Shadowrun: Dragonfall, was a confident sequel. Hopefully this latest look at that world will continue to build on the series' strengths. To mark the occasion, Harebrained has released a bunch of screenshots and gifs. You'll find them below.